Here is a Quick Guide On What We Offer That Can Help You Get Your Clothing Made Professionally By Clothing Manufacturers. 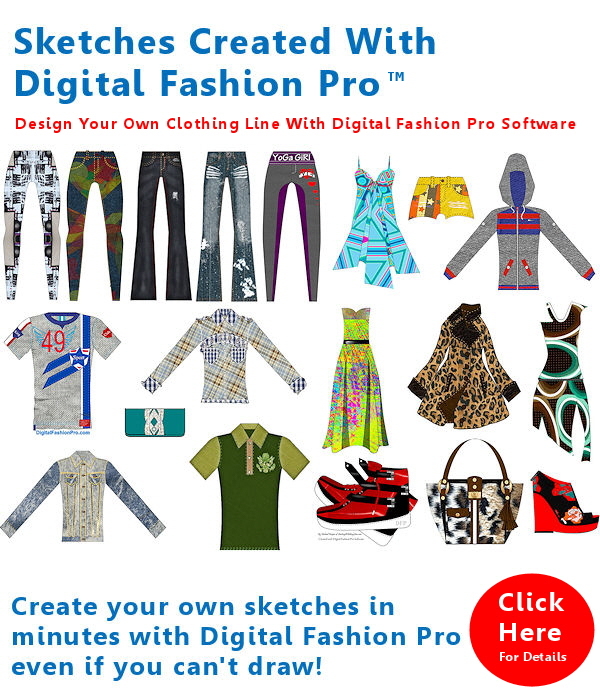 1 – Digital Fashion Pro Industry Edition is needed for making professional / manufacturer approved regular design sketches and technical design sketches. Both are needed to get items made by a manufacturer. The regular fashion sketch (clean version of your design without any markups) of your style shows your manufacturer how your design should look once made. Technical sketch shows your manufacturer how to measure your design. It is a technical markup of your sketch (blueprint). Digital Fashion Pro Business or Industry Edition can help you make the sketches and both are included in the Fashion Mogul Edition. 2 – Those things are then added to a spec sheet in which manufacturer needs. Spec Sheet Templates are included on the Fashion Business Center which are also a product included in the Fashion Mogul Edition of Digital Fashion Pro. 3 – Third you need measurements for your styles. You can create measurements to put on your spec sheet with the book we offer called Spec Book of Standard Garment Measurements. 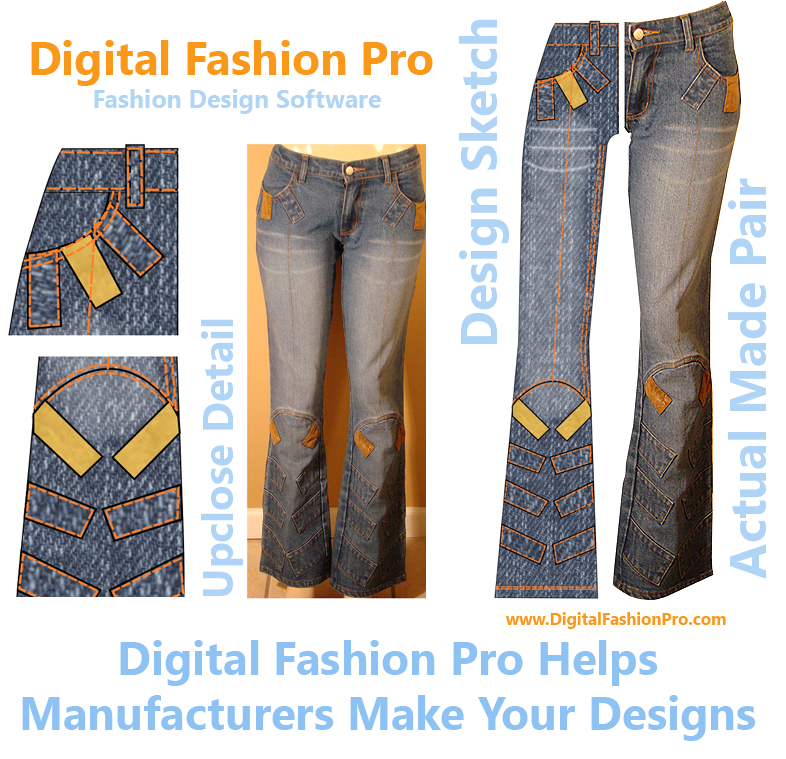 Digital Fashion Pro does not directly create patterns – it creates regular CAD design sketches & technical sketches. Unless you sew yourself – pattern making should be left to the professionals. All The items above will be given to your manufacturer to make your line, to a seamstress or to a professional pattern maker to make your pattern. Also note that the Fashion Mogul Edition also comes with Ultimate List of over 500 Clothing Manufacturing & Fashion Contacts that you can contact to make your clothing. The takeaway is from this Quick Guide is that our Fashion Mogul Edition + the Spec Book gives you the tools and know how to get your line professionally started, designed and made. Once you have your digital design and measurements you are ready to have your item made. Depending on what level of accuracy you want to achieve with the construction of the style will determine who you want to approach to make, how much it will cost to bring the design to life and how much time it will take. If you want a quick sample then working with a local seamstress will prove the fastest. You will be responsible for going to get your own fabric unless you choose some that the seamstress may have on hand. Ultimately, the fabric may not be exactly what you want but you go with it for the sake of speed and ease. Next you will have to wait on the seamstress to sew your design. Depending on his or her workload that could be anywhere from 2 days to 3 weeks. It really doesn’t matter if the seamstress is based out of their home or an office. Home-based sewers can also have a back-load of work as they often sew for many clients plus they are always trying to complete a long project they have been working on in-between jobs. At times one of their well established clients may need some immediate work which will cause them to slack on yours for a couple of days. It comes with the territory. Stay on them but also realize the process is fairly slow. If you need the piece for a photo shoot or in some other official capacity make sure you plan ahead and start the process as early as possible. The second way to get your first prototype made is to use a sampling service. These are professionals that will work with you to create the exact design that you want. They will require that you give them professional digital sketches, technical sketches and measurements. They will need the artwork that will go on the design or the artwork for a print you want to use. They will ask you what type of fabric you want to send you samples of the fabric or ask that you send them fabric samples. They will then send you finalize versions of the fabric samples to get your approval before they actually begin to make the design. As you can see the process is a little more lengthier but you also can see that your design will more than likely resemble your vision more accurately this way. Working with a sampling service can take anywhere from 2 weeks to 2 months depending on a number of factors and how many pieces you have them making. The cost to use a sampling service can be pretty costly as well. Then if you have them creating more than one piece for you the cost can add up quickly. If you are having them create trim like custom buttons and digitizing etc. can also add to the cost. If you are getting a print made you will have to pay for minimum yardage. The best part of using a service is your design will more than likely look exactly how you want because the service wants you to be happy. If they sampling service is not a manufacturer then they will not be able to accurately cost out the design for you when it comes to mass manufacturing. Getting a clothing manufacturer to make your design will prove to be the cheapest but it will also take the most time. A clothing manufacturer will require the same design detail from you as a sampling service would. You can ask them to make the design with available materials or you can have them create the items you need. The process will work pretty much the same as using a sampling service however the manufacturer will be able to tell you what it would cost to manufacture the garment at various quantity levels. Getting samples made at a clothing factory will take anywhere from 3 weeks to 7 weeks. If you do not look professional to them – many will not even communicate back with you. From personal experience there really isn’t a wrong or right way to go about getting your sample made. It really just depends on what you want. Do you want your sample made fast? Is budget a concern? Do you want an accurate sample? Either way, seeing your design come to life can be inspirational and empowering. It will give you the drive to take your new clothing line to the next level. For those of you that have got your first piece sew – we would love to know your experience and how you felt when you first laid eyes on your design brought to life? Leave comments below.